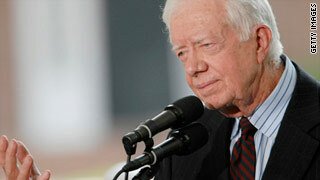 Former President Jimmy Carter has been hospitalized in Cleveland. NBC News has learned the former President fell ill on a flight to Cleveland while on his way to a book signing. The White House said this afternoon that President Barack Obama called Carter from Air Force One. White House Spokesman Bill Burton said Carter was feeling great and planned to resume his book tour Wednesday. MSNBC is reporting a Carter Center official told NBC News that Carter became airsick while on a Delta Airlines flight from Atlanta and vomited. Frigid weather is gripping much of the country as far south as Florida. Fort Lauderdale hit a record low temperature for this date (Tuesday) at 40 degrees. The old record was 42 set in 1841. The National Weather Service issued hard freeze warnings Tuesday night into Wednesday morning for much of Florida with freeze advisories as far south as Hollywood. Cold and snow have hit parts of North Carolina, West Virginia, Virginia, Maryland, Pennsylvania and Vermont. Winter weather advisories are in effect for parts of those states with more snow expected. Question 1 on the ballot in Indiana asks voters if they support making Property Tax Cap laws part of the state constitution. Lawmakers expect the proposal to pass, but Terre Haute Mayor Duke Bennett says the caps are bad for cities who are struggling with the lack of revenue. The Mayor says more cuts must be made to make up for the loss in revenue from the property tax caps. Over the past two years, the caps have forced the city to cut more than $5.5-million. Terre Haute is the 7th hardest hit city in the state when it comes to the caps' effects. "It all sounds good. Everybody wants their taxes to go down," says Bennett. "But people don't realize that the translation is, you pay less, there's less service and people are not going to be happy with that in future years. I've not seen a lot of resistance to it out there and I don't think people really understand the true impact and cities and towns are the hardest hit because you can't raise any new revenue." One city service that won't be cut this year is the city's leaf pick-up. Last year, city leaders thought they wouldn't be able to afford to do it this year. Wednesday, the Mayor said they'll make one pass to pick up the leaves if they are raked out to the curb. Republic will also continue to collect bagged leaves. The Mayor doesn't know if the city will be able to afford the program next year. A Virginia man, born in Pakistan, was arrested Wednesday for allegedly casing Washington area Metro stations to possibly carry out a bomb plot on the Nation’s Capitol, police sources said. 34-year-old Farooque Ahmed is accused of approaching government employees, he thought were al-Qaida operatives, to join the so called bomb plot on Washington’s Metro. NBC News has learned the ruse was conducted over the past six months and it allegedly involved Ahmed handing over video of northern Virginia subway stations to the men the thought were connected to the terror group. Sources say he suggested using rolling suitcases, instead of backpacks, to kill as many people as possible. Investigators also tell NBC Farooque offered to donate money to al-Qaida. The FBI says the public was never in danger since agents knew what Ahmed was up to. They say he was monitored throughout the entire course of the investigation. FROM MSNBC: Hundreds of people were buried in their homes early Tuesday after a rain-soaked mountainside gave way in southwestern Mexico, officials said. Donato Vargas, an official in Santa Maria Tlahuitoltepec reached by phone, said 500 people were missing and that 300 homes were buried after the slide around 4 a.m. local time. "We were all sleeping and all I heard was a loud noise and when I left the house I saw that the hill had fallen," Vargas said. "It has been difficult informing authorities because the roads are very bad and there isn't a good signal for our phone," Vargas said shortly before the call dropped. Reached by the news agency AFP, Vargas added that "we fear that those missing are buried inside their homes because we've already searched nearby areas." It was suppose to be “lol” funny! But I’m not sure members of Congress got the joke. Comedy Central star Stephen Colbert appeared on Capitol Hill today as a witness on the issue of migrant farm work. “I certainly hope that my star power can bump this hearing all the way up to C-SPAN One,” Colbert told members of the subcommittee. Stephen Colbert’s character comes across as a right-wing activist, ready to join the Republicans at any moment (while not confirmed, most think it’s just an act). “We have to do something” about the plight of farm workers “because I am not going back out there,” Colbert jabbed. “At this point, I break into a cold sweat at the sight of a salad bar,” he said. It’s obvious his comments were meant to be taken light-heartedly by the elected officials but, as TV cameras showed glimpses of the committee members, not many seemed amused. Some chuckled, others laughed out loud, but the majority rolled their eyes and sat expressionless as Colbert ranted on several issues including immigration and the economy. House Speaker Nancy Pelosi told reporters she thinks Colbert's appearance was appropriate. "He's an American. He comes before the committee. He has a point of view. He can bring attention to an important issue like immigration," she said. "I think it's great." Thank you for checking out my blog. Feel free to browse, comment and participate in my Sound-Off Web Polls. The information in these stories come from several sources from network news to my own sources in Indiana, Washington D.C. and elsewhere. While many other blogs give the author's point of view on a variety of topics, it's my goal to present the information in an impartial fashion so you, the reader, can form opinions for yourselves. I'm a firm believer in the old-fashioned style of news where the accurate information is the highlight, not the "If it bleeds, it leads" philosophy. Again, thank you for checking out the blog and enjoy! I'd love to hear from you. If you have story ideas or ways I can improve the blog, feel free to shoot me an e-mail at dshepherd@wtwo.com. I was recently honored to win a Spectrum Award for Best in General News by the Indiana Broadcasters Association for a story I did for NBC 2 WTWO-TV in Terre Haute. This is my first award from the Broadcasters Association. I’d like to thank my photographer, Josh Lum, for shooting and editing the piece. Without his stellar work, this award would not have been possible. Democratic candidates for state office were in Terre Haute Friday stumping for last minute votes. The candidates for State Treasurer, Secretary of State, and State Auditor greeted supporters. As the election enters the home stretch, the democrats know they have ground to make up if they want to pull out a win on Tuesday. Democratic Senate candidate Brad Ellsworth also made a stop in the Valley Friday. Ellsworth spoke to a group of ISU students at Rhodes Hall. The Senate hopeful discussed a variety of issues including Cap and Trade and the economy. Ellsworth says his campaign is in full gear leading up to Tuesday’s election. "It's going really well. I just left Indianapolis. I was in a room full of people; volunteers that were stuffing walking bags and making phone calls and that's really what it's down to now, is the ground game of who gets the votes out." Ellsworth is running against Republican Dan Coats and Libertarian Rebecca Sink-Burris in Tuesday’s election. The death toll stands at 19 in Indonesia after its most active volcano, Mount Merapi, erupted Tuesday morning; spewing smoke and ash for miles. NBC News reports one of the dead was a young baby. There were also slew of other injuries. Terrified villagers fled their homes following Tuesday morning’s eruption. The death toll is expected to rise. Democrats are starting to smell blood in the water as new polling shows President Barrack Obama’s approval rating dropping to record lows. Only 42 percent of Americans approve of President Barrack Obama’s job performance, according to a new CNN / Opinion Research Corporation poll. The poll shows 54 percent of Americans are not satisfied with the administration’s performance. A sluggish economy and the wars in Afghanistan and Iraq have taken support for Mr. Obama to an all-time low. Other democrats, some who are running in November’s mid-term elections, aren’t doing much better. Congressional Democrats face a nine-point deficit when those polled were asked which party they’ll support in November. Some political analysts say Republicans have a serious shot at picking up the 39 seats needed to re-take control of the House of Representatives (currently held by the Democrats). Those Democrats may not be asking the President to stump for them any time soon. Only 37 percent of likely voters say they are more likely to vote for a candidate backed by Mr. Obama. Nearly half of those polled said they’d likely choose a candidate supported by the Tea Party movement, an ultra-conservative base that’s gained growing support in recent months. The poll also shows the majority of Americans believe Republicans, in general, are more engaged and excited about voting than their Democratic counterparts. "Well, it was offensive. It was hateful," Obama said in part of an interview with BBC Persian released by the White House. "And particularly for him to make the statement here in Manhattan, just a little north of ground zero, where families lost their loved ones -- people of all faiths, all ethnicities who see this as the seminal tragedy of this generation -- for him to make a statement like that was inexcusable," Obama said. During Thursday’s U.N. address, Ahmadinejad blamed the United States for the terror attacks on September 11, 2001, saying the U.S. was behind it. I Iranian President’s remarks caused delegates from the United States, Europe and other countries to walk out of the U.N. General Assembly in the middle of his speech. counterpart Friday for what he called offensive and hateful remarks about the September 11 attacks.